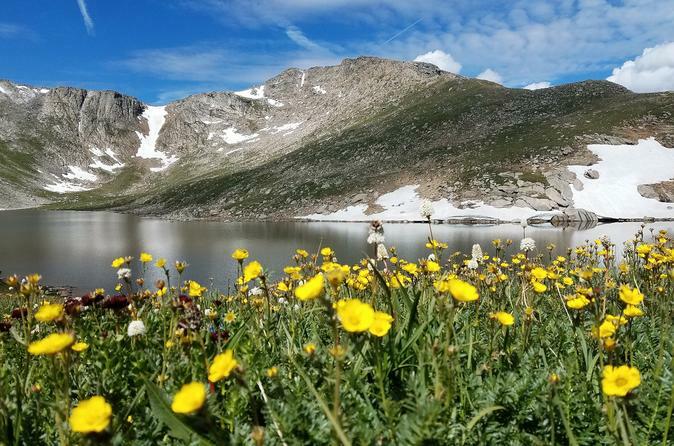 Travel through rugged Clear Creek Canyon on your way up the highest paved road in North America into the Mount Evans Wilderness Area (admission included) where you will reach an altitude of over 12,800 feet at beautiful Summit Lake and 14,265 feet (4,348 meters) if conditions allow us to the summit. See breathtaking views of the Majestic Rocky Mountains, view bighorn sheep and mountain goats in their natural environment. Stop for lunch and shopping in Idaho Springs, a real old-western town, before returning back to Denver. ou will continue on your climb up even further to where you will reach an altitude of over 12,800 feet at stunning Summit Lake, view Bighorn Sheep and Mountain Goats in their natural environment and if conditions allow us to reach the summit of the mountain you will be standing at 14,265 feet (4,348 meters) on the top of Mt. Evans, and what feels like the top of the world! All along this scenic tour you will see breathtaking views of the Majestic Rocky Mountains. After all of that fun and excitement we will climb back down the mountain to stop for lunch in Historic Idaho Springs, a real old-western gold rush town. You will have time to visit the local shops and eat lunch on Miner Street before returning back to Denver where you will be returned to Union Station. Snacks, bottled water and admission are included on this tour. The entire tour lasts approximately 7 1/2 hours.